How big do you like your posters to color? Giant? Large? Huge? How about all of the above? If you're looking for super-sized posters to color, you've come to the right place. 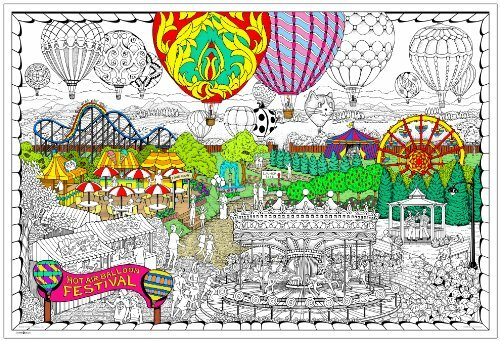 This wall poster is truly amazing with countless details and hours of exploration and coloring fun! With all of these rooms open to your view, you are the interior designer (all without having to move heavy furniture around!) How will you decorate your new house? Stuff2Color is proud to offer you our largest sized poster coming in at a whopping 22x32½ inches. These line-art designs are more than double the size of our normal posters which means even more time for you to spend illustrating. They are drawn by a growing list of international artists who draw scenes from nature, from fantasy, from cultural history, or a combination of all three. The art has sharp edges and clean lines giving you more room to apply any number of shading and coloring techniques. We print these large posters in the USA on heavy stock, bright-white, paper. 22" x 32.5" inches - Arrived in rigid reusable tube.